BLOOMINGTON, Ind. -- Indiana University's Jacobs School of Music announced today that 28-year-old Krzysztof Urbanski will be appointed an adjunct professor of music in the area of orchestral conducting. It was also announced this week (Oct. 19) that the Polish conductor will become music director of the Indianapolis Symphony Orchestra. 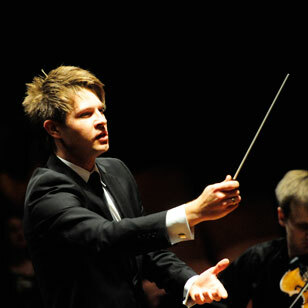 He is the youngest music director among major orchestras in the United States. Urbanski is the first music director of the Indianapolis Symphony Orchestra to assume a faculty position in the Jacobs School. He will begin his activities in Bloomington in the fall of 2011, while his role as music director of the ISO begins Sept. 1, 2011. He becomes the music director designate immediately. "We welcome this opportunity to associate with one of the young talents of the international conducting world as part of our evolving relationship with the Indianapolis Symphony," said Gwyn Richards, dean of the Jacobs School of Music. "Krzysztof's youthfulness, musicianship and international scope herald a defining moment in the evolution of the orchestra." Urbanski has had a number of recent successes with orchestras throughout Europe and Japan. He was named chief conductor of the Trondheim Symphony Orchestra in Norway after just one appearance with that orchestra in September 2009. Following his U.S. debut with the Indianapolis Symphony Orchestra, Urbanski made his celebrated debut with Chicago's Grant Park Orchestra and the Houston Symphony and continues an extensive schedule of guest conducting engagements this season with orchestras throughout Europe and in Japan. He graduated from the Chopin Music Academy in Warsaw in 2007, and that year he was the unanimous first prize winner of the Prague Spring International Conducting Competition. "We welcome Krzysztof Urbanski to the conducting faculty of the Jacobs School of Music and look forward to a fruitful collaboration with him," said professors David Effron and Arthur Fagen, chair and acting chair, respectively, of the Jacobs Orchestral Conducting Department. The ISO will be performing on Jan. 9 in Bloomington's Musical Arts Center. The program will include the premiere of IU Chancellor's Professor of Music Claude Baker's work "Concerto for Piano: Noon to Starry Night." Conductor Krzysztof Urbanski becomes the Indianapolis Symphony Orchestra's seventh music director Sept. 1, 2011. He also assumes duties as an adjunct professor of music with the Indiana University Jacobs School of Music that fall. Urbanski became chief conductor of the Trondheim Symphony Orchestra in the 2010-11 season and was appointed to that role the week after his highly successful debut with that orchestra. In April 2010, he made his highly acclaimed U.S. debut with the Indianapolis Symphony and returned for a second visit during Marsh Symphony on the Prairie in June. Other North American debuts included Chicago's Grant Park Orchestra and the Houston Symphony. This season, Urbanski will debut at the Philharmonia Orchestra, the Royal Scottish National Orchestra, the Bamberger Symphoniker, the Deutsches Symphonie-Orchester Berlin, the MDR Sinfonieorchester Leipzig and the Stockholm Philharmonic. His schedule of return visits includes the NDR Sinfonieorchester Hamburg, Radio Sinfonieorchester Stuttgart, Frankfurt Radio Symphony Orchestra and Göteborgs Symfoniker. Following highly successful debuts with the Tokyo Symphony and Osaka Philharmonic Orchestras in autumn 2009, he has been invited to return to both in spring 2011. Polish repertoire plays an important part in Urbanski's programming. He led the opening concert of the Polish focus at the 2010 Schleswig Holstein Festival with Sinfonia Varsovia, conducting Chopin's Piano Concerto No. 1 with Eva Kupiec and Górecki's Symphony No. 3. He made his debut at the 2010 Grant Park Festival in Chicago with a program including Lutosawski's Concerto for Orchestra and conducts Penderecki's Threnody to the Victims of Hiroshima with NDR Sinfonieorchester Hamburg in fall 2010. Urbanski graduated from the Chopin Music Academy in Warsaw in 2007, and, in the same year, was the unanimous First Prize Winner of the Prague Spring International Conducting Competition. He works regularly with all the major Polish orchestras, including Sinfonia Varsovia, the National Polish Radio Symphony Orchestra and Poznan Philharmonic Orchestra, and served as assistant conductor to the Warsaw Philharmonic Orchestra from 2007 to 2009. Urbanski was born in Pabianice, Poland. He and his wife, Joanna, currently reside just outside Warsaw.